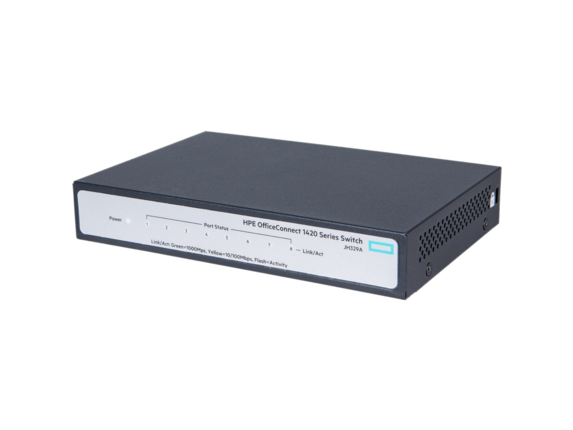 The HP 1420 Switch Series consists of unmanaged Gigabit Ethernet switches, for small business and others looking for plug-andplay basic Layer 2 connectivity for their network, including low-cost PoE+ and 10-Gigabit uplink models. 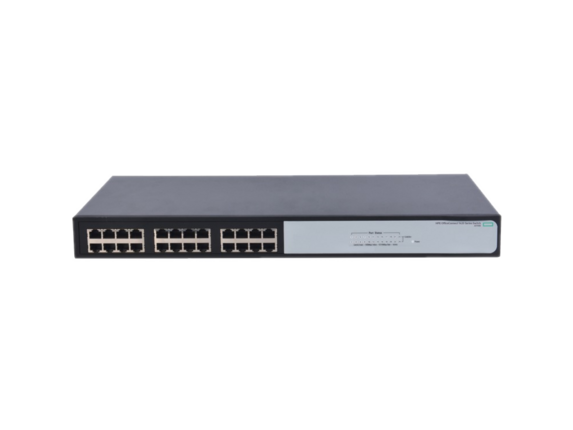 The 1420 Switch Series includes four Gigabit switches. All have 10/100/1000 ports for affordable Gigabit connections using copper Cat 5e cabling. There is a 16-port RJ45-only model. There is a 24-port model with two SFP Gigabit ports, ideal where long distances require fiber-based connections. Another 24-port model supports IEEE 802.3at PoE+ on 12 of its ports, able to forward up to 30W power on these ports to power Access Points, IP phones, IP cameras and other PoE-enabled devices. For cost-effective high-speed fiber-based server connections, there is a 24-port 10/100/1000 switch with two SFP+ 10-Gigabit ports. 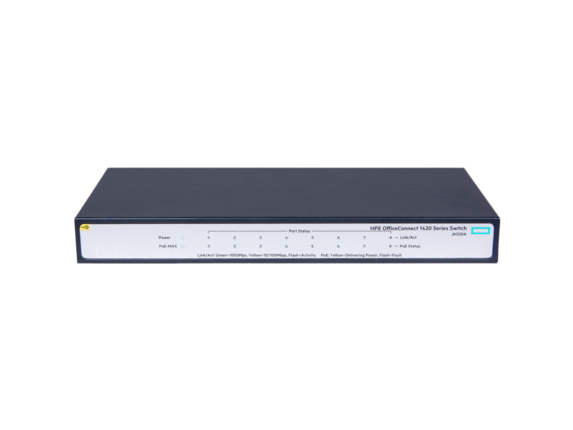 HP 1420 switches have quality of service (QoS) support and IEEE 802.3x flow control features that improve network efficiency. Simplified plug-and-play convenience is supported by features such as auto-MDIX and autospeed negotiation. HP has innovated and combined the latest advances in silicon technology to bring you some of the most power-efficient switches. All models support the Energy Efficient Ethernet IEEE 802.3az standard, as well as auto power-down mode on idle ports, and power saving on short-distance cables. With their fanless silent operation, these switches are ideal for office deployment. HP 1420 switches come with a limited lifetime warranty covering the unit and power supplies, as well as 24x7 phone support for the first three years of ownership. Simplified plug-and-play convenience is supported by features such as auto-MDIX and autospeed negotiation. HP has innovated and combined the latest advances in silicon technology to bring you some of the most power-efficient switches. All models support the Energy Efficient Ethernet IEEE 802.3az standard, as well as auto power-down mode on idle ports, and power saving on short-distance cables. With their fanless silent operation, these switches are ideal for office deployment. 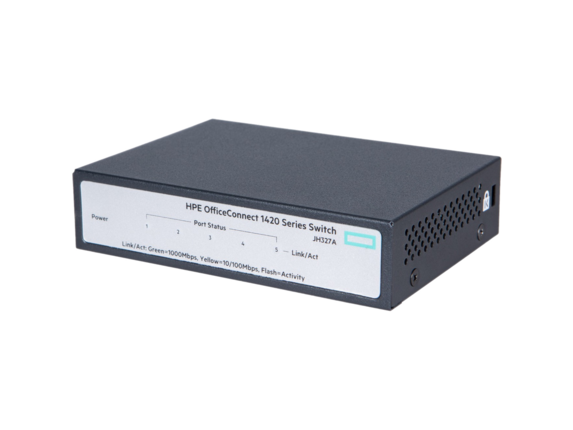 HP 1420 switches come with a limited lifetime warranty covering the unit and power supplies, as well as1030243913 24x7 phone support for the first three years of ownership. 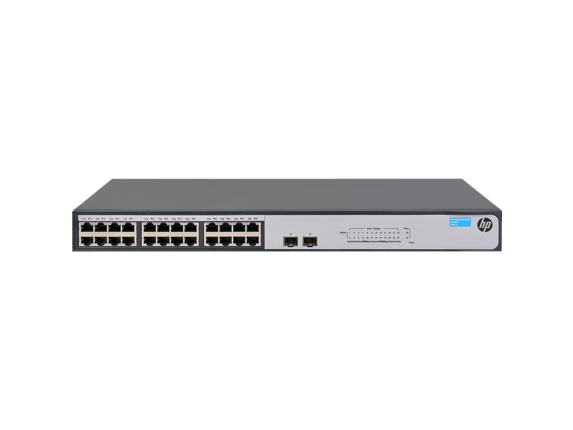 Upgrade your networking systems to a hassle-free solution or replace older devices with one of our powerful series of compact, high-performance HP Switches, a nine-unit series tailored to fit any office. Not sure whether you need to replace your office’s existing networking switches? If you’ve been using any number of devices supporting typical Fast Ethernet standards, you’ll be amazed at the difference when you experience the power of gigabit Ethernet (GbE). With an HP Network Switch, you can say goodbye to larger and louder models in addition to the confines of previous connection standards. Each unit offers as much as 10 times the performance of previous Fast Ethernet systems, so you’re in for some pleasant surprises. Need a small-scale hub? Or maybe you want to maximize your office’s potential connectivity? We’ve got you covered in both scenarios. 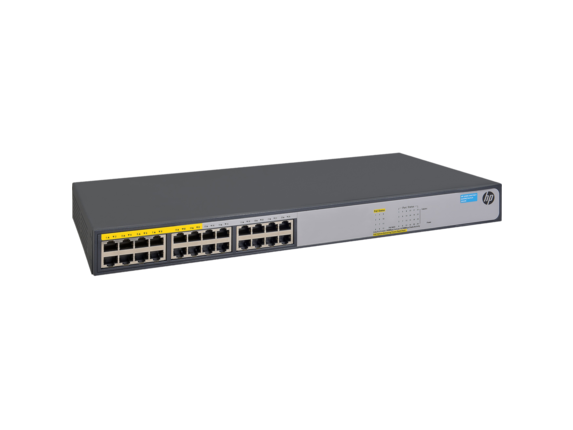 HP 1400 Series Switches offer compact configurations with as little as 8G and right on up to our expanded models, offering as much as 24G. Bear in mind if you do opt for the extra capacity, you won’t have to sacrifice much more than a few inches of deskspace for the addition. HP Switches feature our sleek design and all models are well under a foot wide. Most of the series is also totally modular for easy mounting. Want a networking solution setup for your connected devices that also offers the efficiency of Power over Ethernet? Consider one of our PoE+ configured models, like the slim HPE OfficeConnect 1420 8G PoE+ (64W). You’ll be able to manage your office’s wireless access points or IP phones and cameras with ease and at no cost to your valuable space or existing cable burden. Need a high-capacity solution that offers freedom and durability? Give your office the convenience of our HPE OfficeConnect 1420 24G Switch, stacked with 24 1GbE connections. You can also opt for one of our small form-factor pluggable (SFP+) configurations if you need compatibility with gigabit fiber. The idea of a networking systems can riddled with cliches of clutter and distraction, which is why we made sure each and every HP Switch is designed with efficiency in mind. Expect quiet running and a simple out-of-the-box setup. Rein in the chaos and land a blow against inefficiency with one of the simple and scalable HP Switches from our powerful 1400 Series.